Her younger brother, still a child, is not able, not even willing to lie with her and make her pregnant. This is a disaster for she is badly in need to conceive an heir to the Egyptian throne. Her father, the King, has a problem too. King “Great – House”, has failed to finish his royal run *, a ritual which seals the prolongation of his Godlike status for another year. In the sweltering heat, moments before successfully accomplishing the expected feat he stumbles and crashes down in the dust. The onlookers, his subjects flocked together to encourage their King, are stunned and schocked. If the King cannot succeed his run, how can he keep the skies from falling down, how can he make the Nile rise once more? As the bloodline of the Kings has to remain pure and a non – incestuous relation never an option for the succession, Pretty – Flower’s only possibility is to get her father to sleep with her. With a lascivious dance, during the ensuing ceremonial feast, she tries to get his attention. But the old King is absorbed by the chess-game he plays with his Vizir and the stories his Jester “Liar” tells him. At the end of a furious dance “Pretty – Flower” collapses. She has failed to arouse her father. The weak King, symbol of the kingdom of Egypt” has turned impotent too. The Vizir, unaware of the Prince unwillingness to sleep with his sister, starts the preparation of the King’s planned death and his immediate succession. Published in 1971, The Scorpion God is a compilation of different “short novels”: the title story set in a proto-dynastic Egypt ( 3200 – 3000 BC ), the humorous Clonk Clonk, ( 1971 ) and Envoy extraordinary ( 1956 ) . The three stories share the theme of early societies in trouble. This compilation is nearly the last and only work Faber and Faber could still wrestle out of Golding in ’71. It would effectively mark a long intermission in Golding’s literary output. Some would even announce the end of Golding, seeing in the “Impotent King” a symbolic echo of the drying up of the writer’s inspiration. During the decade following his first novel “Lord of the Flies”, Golding had been the most fascinating of writers, submitting masterpiece after masterpiece: “the Inheritors” ( 1955 ), “Pincher Martin” ( 1956 ), “Free Fall” ( 1959 ) and “ The Spire” ( 1964 ). But the sustained hard work and Golding’s personal problems, most notably the depressions of his son David, had taken their toll and indeed after the Scorpion God it was over. It was over for the next eight years until Golding would come back with his “Darkness Visible” and his “To the Ends of the Earth” trilogy. The writing of the Scorpion God is still brilliant and it is truly impressing with what subtlety and with what few words he creates the ancient civilisation out of the trembling light that hovers over the incandescent desert sand. 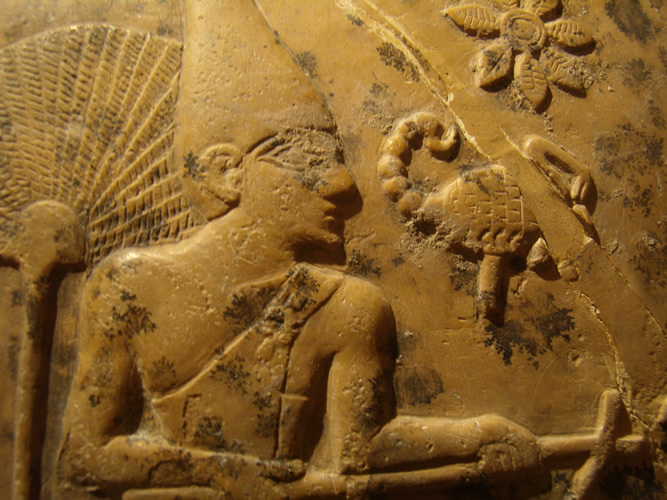 But there is more in the Scorpion God than just beautiful phrases. A hint to a deeper understanding lies in the “Liar” character. A slave from the North, he is the Jester and favourite of the King. His nickname “Liar” summarizes the opinion of what the people think about the many stories he tells. However entertaining, these narratives are so “off the wall”, that the Egyptians think of them as fairy tales. Not that Golding did not aim to be a realist. He had an argument with Faber and Faber, about the cover of his book. The first edition picture, based on an advice by the British Museum, showed a Pharaoh in full regalia. Golding, well informed, argued that the depiction was not of “Narmer”, one of the possible candidates for the mysterious Scorpion God. But it was too late, the printers were in a rush and the depiction of the Narmer Palette was put aside. If nothing else, my illustrated review gives me the opportunity to give Golding what he asked for: a depiction of the true Scorpion God!